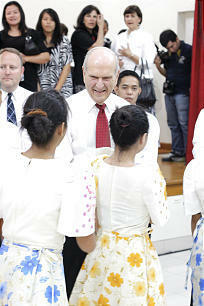 When Elder Russell M. Nelson dedicated the new missionary training center that stands near the Manila Philippines Temple, he was a witness of and a participant in the ongoing growth of the Church in this southeastern nation of islands in the western Pacific Ocean. The Philippines Missionary Training Center, which Elder Nelson dedicated on May 20, can house up to 144 missionaries from the Philippines, Cambodia, Hong Kong, India, Indonesia, Mongolia, Pakistan, Sri Lanka, Taiwan and Thailand. These "locally grown" missionaries are trained in the languages of their home countries.